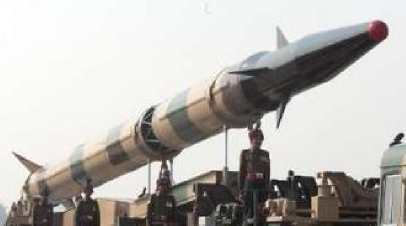 India's solid-fuel ballistic missile "Agni"
India's "Agni" missile family is envisaged to be the mainstay of the Indian missile-based strategic nuclear deterrence. The Agni family will continue to grow its stable, providing a breadth of payload and range capabilities. 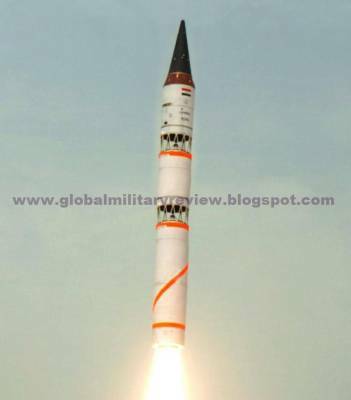 The Agni-I is a short range ballistic missile (SRBM) with a single stage engine. 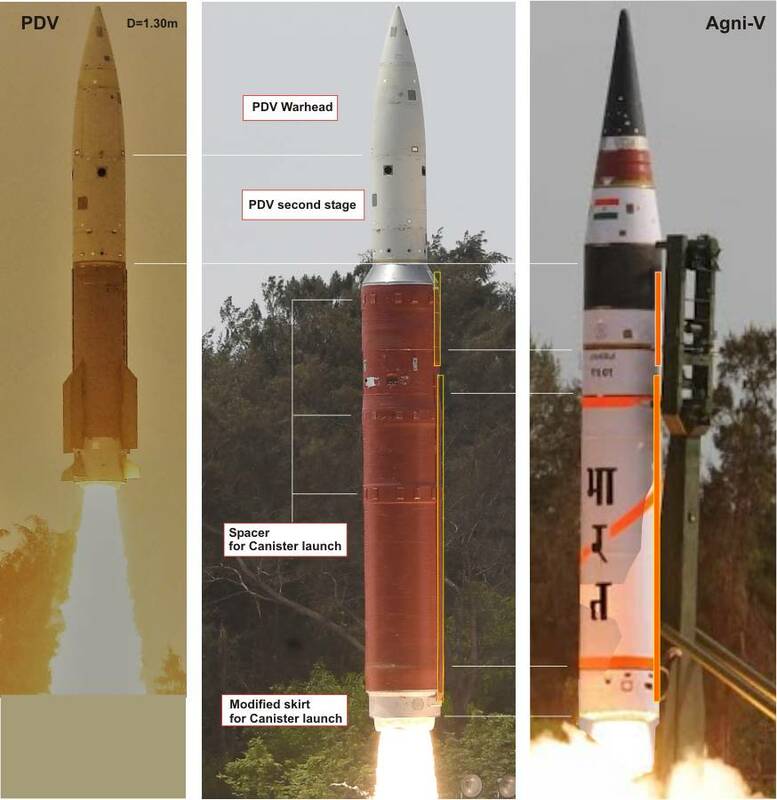 While the Agni-II is an intermediate range ballistic missile (IRBM) with two solid fuel stages and a Post Boost Vehicle (PBV) integrated into the missile's Re-entry Vehicle (RV). The Agni's manoeuvring RV is made of a carbon-carbon composite material that is light and able to sustain high thermal stresses of re-entry, in a variety of trajectories. 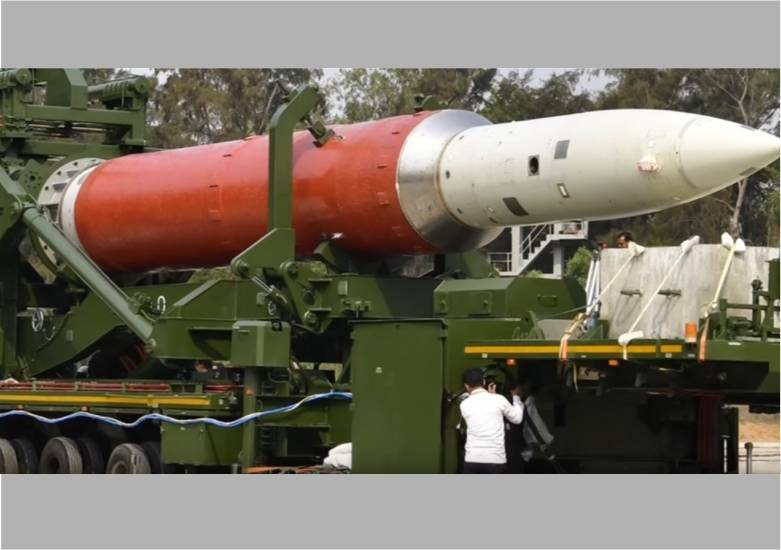 The Agni-IIAT( -II+; -IIP; -IV) is a more advanced version of Agni-II, albeit with more sophisticated and lighter materials, yielding a better range and operating regime. Agni-III and Agni V are compact long range missiles in development and/or test phase. • Agni-TD : Two stage, solid booster and liquid fuelled second stage. • Agni-I : Single stage, solid fuel, road and rail mobile, SRBM. • Agni-II : Two stage, solid fuel, road and rail mobile, IRBM. • Agni-II+ (-IV) : Two stage, solid fuel, road and rail mobile, IRBM. 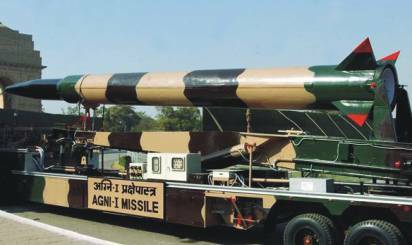 • Agni-III : Two stage, solid fuel, road and rail mobile, IRBM. • Agni-V/TD : Three stage, solid fuel, ICBM Demonstrator (first version). • Agni-V : Three stage, solid fuel, road and rail mobile, ICBM. • ADV : Two stage, solid fuel, + ADV. 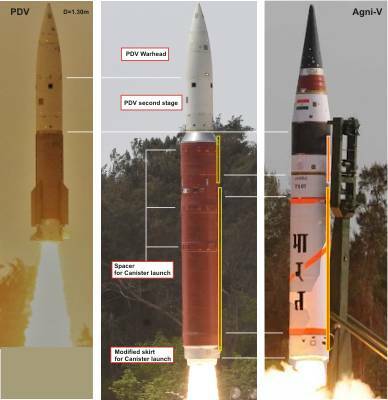 The original Agni-TD was an amalgam of the Prithvi-I and the SLV-3 booster. The Agni-TD is a two-stage missile with the first stage using the first-stage solid-fuel booster motor of the SLV-3 satellite launch vehicle. This marked the first time that India had used directly a component of its civilian space research program for military purposes. The Agni-TD was a cheap test vehicle to prove re-entry and guidance technology for use on a more advanced platform. The missile used a solid booster that was improved but similar to S-1 stage. 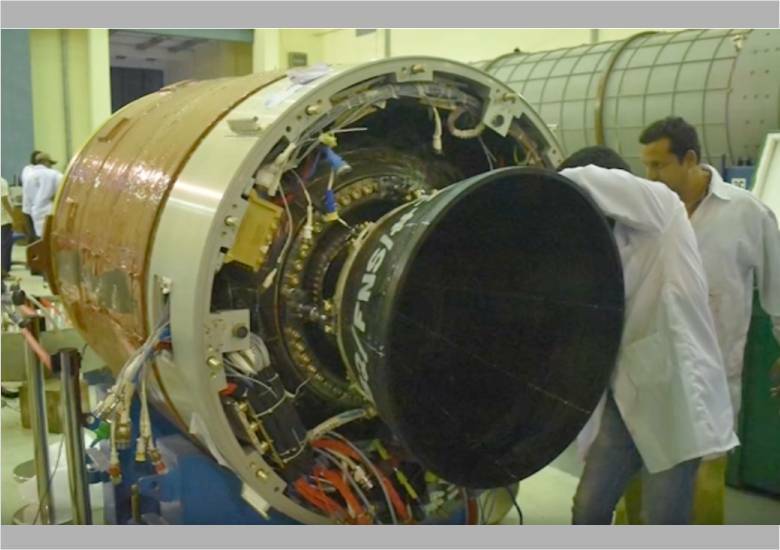 Instead of developing a new solid motor for the second stage, which would have involved significant delays, it used a shortened version of the liquid fuelled Prithvi-I motor. 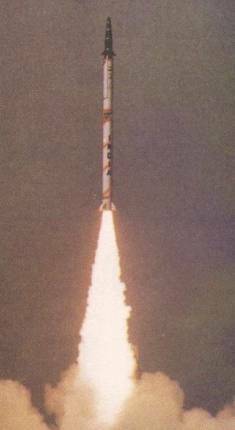 The first Agni launch on 22 May 1989 used a shortened Prithvi-I stage as the second stage. The second Agni test used a second stage with more fuel and longer burn that was ignited before separation thus obviating the need of six-ullage motors used in the earlier launch. The RV used multi-directionally reinforced carbon-fiber preform (MRCP) technology. 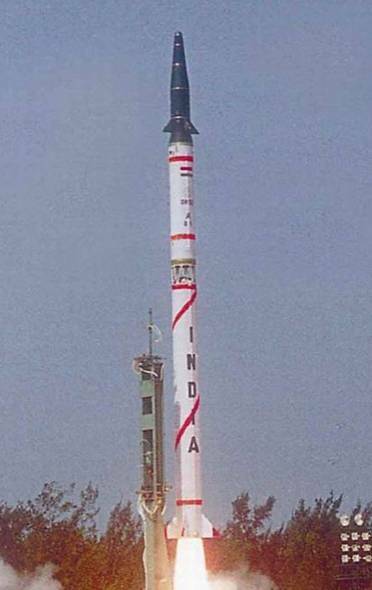 The last test of the basic Agni-TD on 19 February 1994 was a major technical breakthrough. First Stage: The booster motor is one meter in diameter and ten meters in length. It has approximately 9 tons solid propellant. The stage features three segments of propellant grain, with an internal star configuration for increased thrust during the initial boost phase. The motor case is made of a high-strength 15CDV6 steel and is fabricated by conventional rolling and welding techniques. 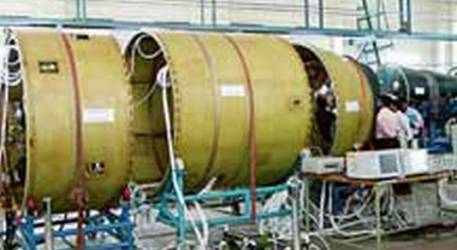 The propellant used in Agni-TD consists of the AP-Al-PBAN composite propellant. All later Agni variants use HTPB (hydroxyl-terminated polybutadiene). The propellant is of star configuration with a loading density of 78%. It is case bonded with a liner system between propellant and insulation. The motor's nozzle is built from 15CDV6 steel; a carbon-phenolic thermal protection system is used for the convergent throat, high-density graphite is used for the throat, and carbon and silica-phenolic lining is used in the fore end and aft end of the divergent. 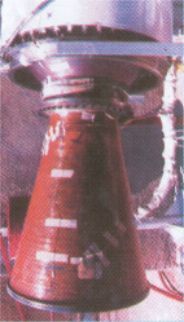 Second Stage: Agni-TD used a Prithvi-I as its second stage, which has two small engines. The initial test flight used a Prithvi-I with lesser fuel of TG-02/AK-20 (Xylidiene + Triethylamine/IRFNA+ NTO), later flights used full fuel configuration. The case material of the second stage is aluminium alloy. ? ? liquid ~3.60 ? ? ? The Agni-I is a single stage version of the Agni-II missile. It stands at 15 metres, weighs 12 tons and serves as a medium range ballistic missile. The missile was developed when the need for an intermediate range missile – addressing the range gap between the Agni-II and the Prithvi. The Agni-I is effectively the Agni-II minus it's second stage. However this configuration puts greater 'G force' stresses on the RV and avionics, when the stage completes (about 18G instead of Agni-II's maximum of ~9G) its journey. The propellant used in Agni-I consists of HTPB (hydroxyl-terminated polybutadiene) solid propellant. 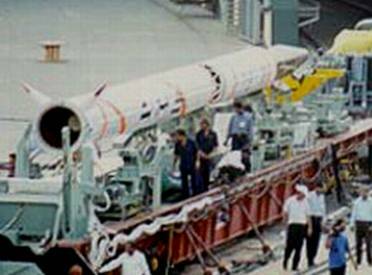 The Agni-II was first tested on 11 April 1999 from a converted rail carriage, with a carriage roof that slides open to allow the missile to be raised to the vertical for launch by two large hydraulic pistons. 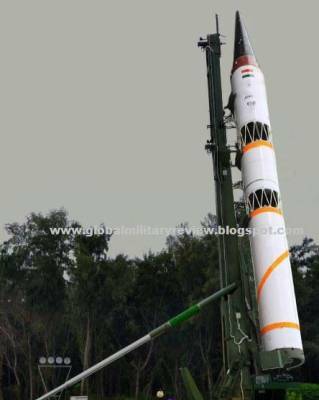 The missile was launched from Wheeler Island, Balasore. The Agni-II missile can also be launched from a road TEL vehicle, as demonstrated in the second test flight on 17 January 2001. This missile has a theoretical maximum range of some 3,000 km with a 1000 kg payload. First Stage: The Agni-II's first stage is largely similar to that of Agni-TD's first stage. 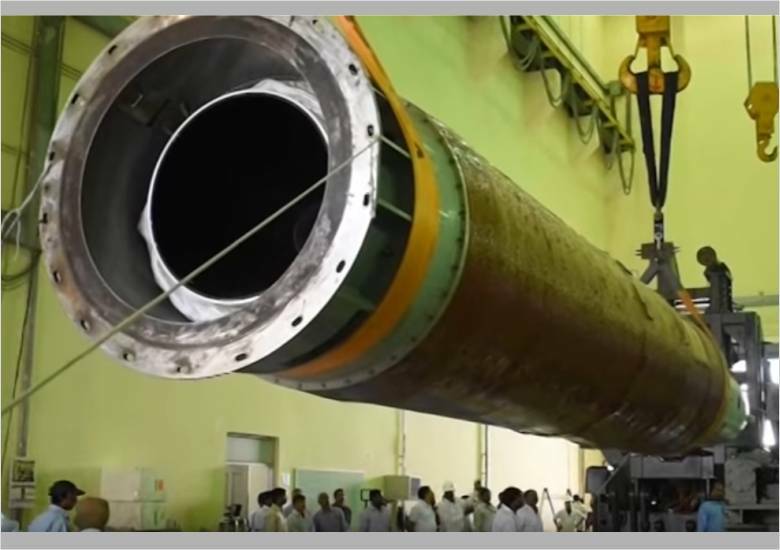 However the Agni-II booster is believed to employ more energetic fuel similar to that used on the PSLV's (Polar Satellite Launch Vehicle) booster stage - ISP of 269 (vacuum) and 237 (sea-level). It has a propellant mass of ~9 tons. Second Stage: The Agni-II's second stage weighs ~4200 kg and uses solid fuel propellant. Its case is presumably made of the same material, high-strength 15CDV6 steel, as the booster stage for ease of manufacturing. This solid propellant stage has flex nozzles for thrust vectoring, for precise trajectory control. Unlike the Agni-TD, the solid fuel second stage does not require retro motors for proper stage separation. Evidently it uses a vented inter-stage. The Agni-IIP (AT) is the result of a CIP (Continuous Improvement Program) with Agni-II. 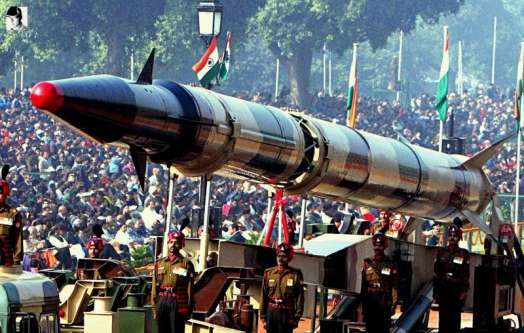 Different reports indicate India developing a more advanced technology (AT) version of Agni-II putting into use, state-of-the-art technologies to significantly improve the Agni-II performance as well as to adapt it to the newer and lighter nuclear payload. The new propulsion system could greatly increase the missile's range to 4000 km (1500 kg payload) and potentially to ICBM range for lighter payload. A larger diameter booster stage made of stronger 250-Marging steel, improving fuel loading and fuel mass-fraction. Lightweight carbon composite motor casing for the second stage, instead of steel casing, improving its mass-fraction. Lighter RV, with all carbon composite re-entry heat-shield, multi directional carbon re-entry nose tip and control surfaces. Second Stage: Lightweight filament wound carbon composite motor casing for Stage-II with improved fuel mass-fraction. Length/Diam. Segm./Nozz. Thrust s.l. Isp s.l. Thrust vac Isp vac Propellant Mass (t) Burn time (s) Flow rate (t/s) Total Vac-Imp. 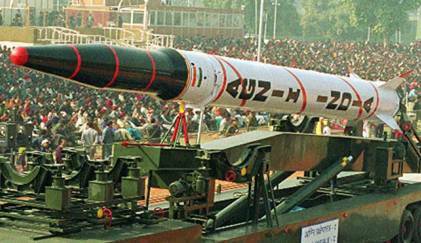 The successor to the Agni-II and the ultimate development of the Agni family is the Agni-III. 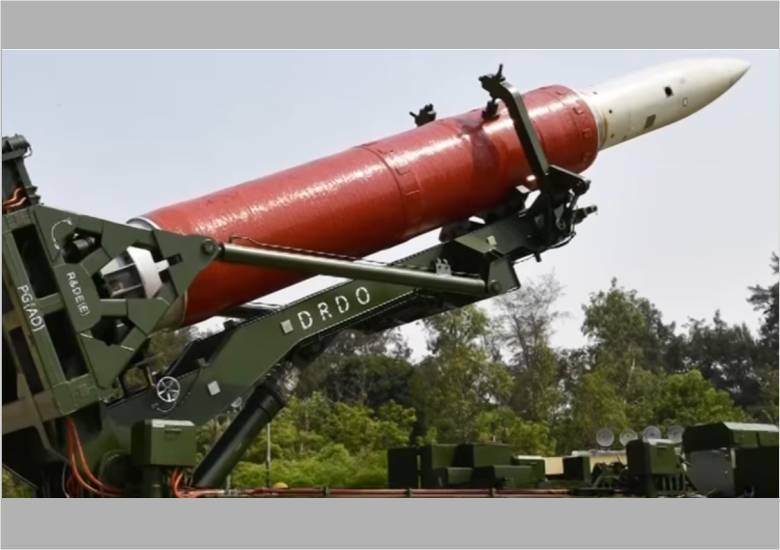 On 17 May 2006 DRDO publicly announced the existence of the missile and issued a short video clip. 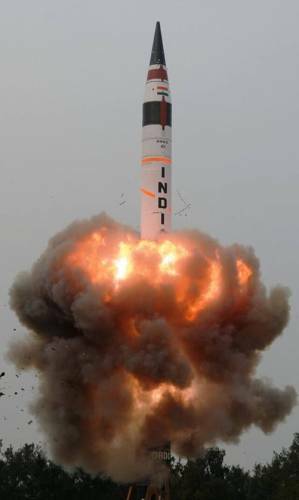 The Agni-3 D1 was first test fired on 9 July 2006, but it failed. In the Agni tribe, Agni-III is a family of large diameter, solid fuel missiles. They are compact and small enough for easy mobility and can be easily packaged for deployment on variety of surface/sub-surface platforms. The 48 tonnes Agni-III uses solid fuel stages with an overall diameter of 2.0 meters. 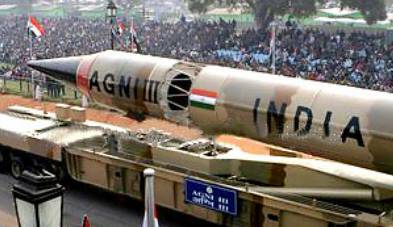 The Agni-III is a 2 stage 16 m long missile with a unary RV payload. The first stage is 7.7 meters long and the second stage 3.1 meters long with a 1.1 meter vented inter-stage. The Agni-III has two solid fuelled stages of 2.0 meters diameter. This diameter is compatible with a recently tested Indian sub-surface launch system, that has a 2.4 meter diameter launch tube. 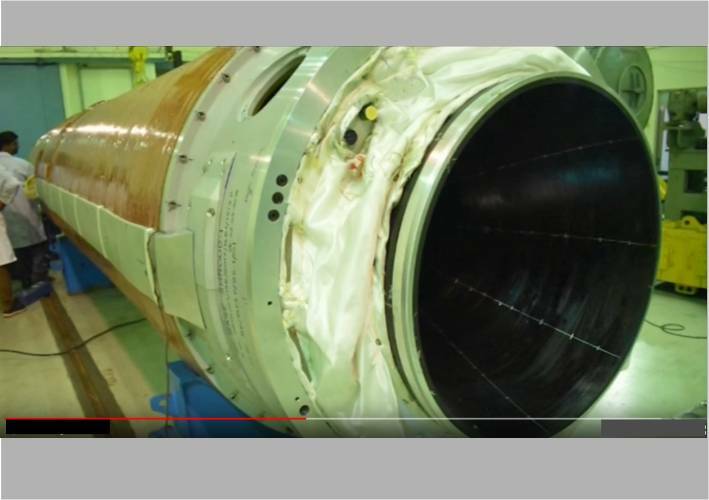 Booster stage uses lightweight composite material case to achieve high fuel mass fraction that is necessary for a small but long range missile. the second stage case is made of maraging steel that will eventually use light weight composites. 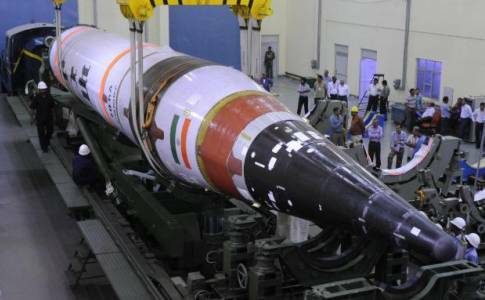 Thus initial Agni-3 version would see payload capability degraded by about 450 kg. First Stage: The first stage is approximately 31 tonnes mass and length of 7.7 meters. This stage's specific impulse (ISP) of 237/269 is believed to be better than Agni-II booster and closer to large solid motor currently in use on Indian space launchers. The stage has 28 tonnes (approx.) of high -energy solid fuel and 75 seconds burn time. Composite material case reduces the dead weight increasing its propulsion efficiency. It employs flex nozzle for yaw, pitch and roll thus dispenses with air fins, enabling container stowage & launch. 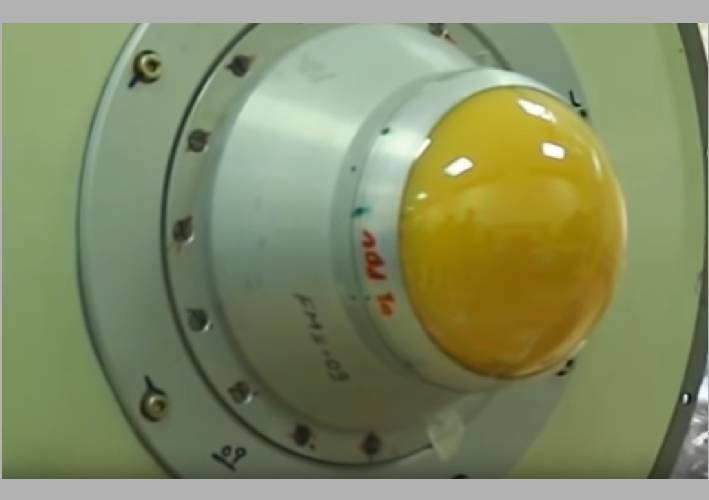 This is the first Indian use of flex nozzle solid fuel stage for booster stage allowing greater flight control during the ascent through dense atmosphere including the maximum-Q point approximately 30 seconds into the flight. Second Stage: The 1.1 meter long vented interstage is light-weight and ensures better vehicle control and reliable second stage separation. The second stage mass is about 12 tonnes and length of 3.9 meters (including 0.8 m payload adapter). The stage currently employs maraging steel case that could be later upgraded to composites to maximize fuel mass fraction that is critical to realize long range, especially with lighter payload. The second stage also employs flex nozzles to provide necessary in-flight trajectory control. The high energy solid fuel of the stage burns slowly for about 105 seconds using high expansion ratio nozzle making it a very efficient engine. The two stage Agni-III would eventually evolve to a full range ICBM by addition of a third stage. This 15 meter tall Agni-V would weight about 52 tonnes. 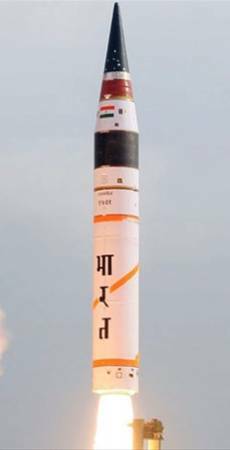 India may soon test Agni-V. The Agni-V will employ three solid fuel stages. The first stage same or similar to that of Agni-III. 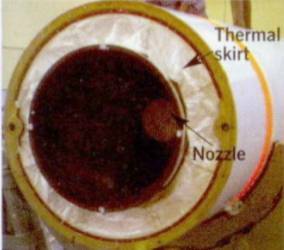 The second stage is a composite fiber case construction that is otherwise similar to second stage of Agni-III. The third stage is a new stage that is approximately 1 meter long, mass of about 3.3 tonnes and flex nozzle for trajectory control. Composite case construction to get high fuel mass Ratio. Stage 3 ~1.0/2.0 m 1/1 solid HTPB ? ? ? ? "India succeeded in destroying a satellite in low earth orbit, but that wasn’t its first attempted ASAT test. India’s Defense Research and Development Organization carried out a failed first attempt to destroy a target in low-earth orbit on February 12. The solid-fueled interceptor missile used during that test “failed after about 30 seconds of flight,” one source told. That test is believed to have been India’s first-ever attempt at using a direct-ascent, hit-to-kill interceptor to destroy a target." • The missle was tested in 'hit-to-kill' mode. • The interceptor was a three-stage missile with two solid propellant boosters. • The first two stages were separated at 45 km and 110 km respectively. • The ‘kill vehicle’ , the third stage of the missile, travelled another 200 km roughly before hitting target. • There were no war heads and the satellite was destroyed within 3 minutes after the launch. • The missile hit the target ("Kalamsat"= C44-PS4 upper stage) within three minutes after lifting off. Comment: I guess that is not an ASAT missile. 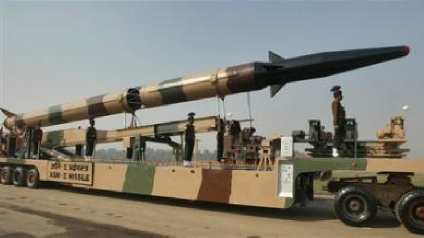 This is India's new Interceptor (Agni Defence Vehicle) with precision WH that will be launched from a canister. The ASAT mission was just a functional test. 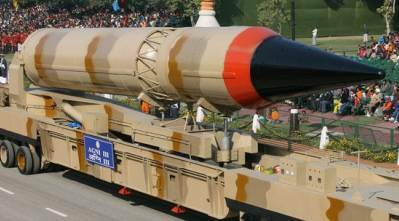 The new Agni Interceptor is most likely a combination of the K-4 SLBM and the upper stage of the Prithvi-III (PDV). On December 17, India failed an attempted launch of a K-4 submarine-launched ballistic missile from a submerged pontoon. The K-4 is currently in development by the Defense Research and Development Organization (DRDO), and is intended for deployment on the Indian Navy’s Arihant-class ballistic missile submarines. It is expected to possess a range of 3,500 km. The December 2017 attempt was the fourth overall test for the K-4 SLBM.